At Blinnk Photography of Hawaii, we believe in the quality of our service and the ability of our team. This confidence allows us to break the rules of professional photography and offer photo shoots with no obligation to buy. Instead, we allow our product to speak for itself. After your photo shoot you will be able to select which images you want to purchase. 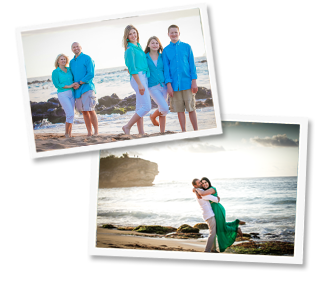 So book your free photography shoot at one of our locations today: Maui, Kona, Oahu, Kauai. Simply review your professionally produced photos and select the images you wish to purchase. Pick a little, or pick a lot, it is completely up to you. Ready to get started? Contact us today by phone or message to book your no obligation, 45 minute professional photo session.